Info "Don't let the pots get TOO boiled!" Watched Pots is a microgame in WarioWare: D.I.Y. Showcase, featured in Wario-Man's stage. Two pots will fall on a stove. When the water boils and steam starts to come out from the pot, the player must tap the switch and turn off the fire. 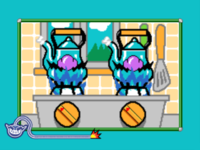 If the player doesn't turn off the stove or turns it off before the water boils with one or both pots, the game is lost. This page was last edited on October 3, 2018, at 21:47.